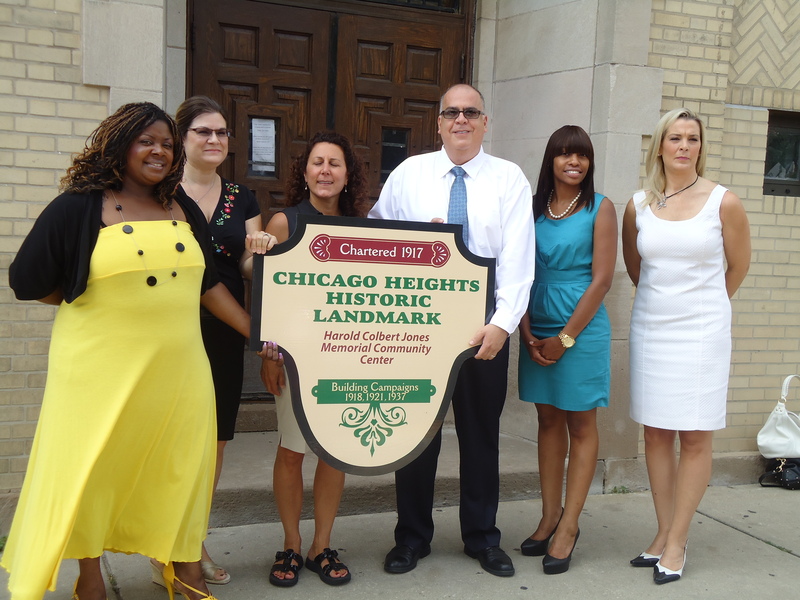 On August 1st the Chicago Height Historic Preservation Advisory Committee was joined by Chicago Heights Mayor David Gonzalez, Alderperson Wanda Rogers, Chief of Staff Lisa Aprati and Cicely Barber, Community Relations Administrator, in presenting to Executive Director Cheryl Roop of the Jones Community Center their Landmark sign. In April the Chicago Heights City Council unanimously voted to give historic landmark status to the structure. Not only has it become an established and familiar visual feature to the City of Chicago Heights, but the Harold Colbert Jones Memorial Community Center remains a focal point of the city today. The community center was chartered November 16, 1917. It grew out of a mission organized by Eugenio De Luca directed toward the Italian immigrant community. 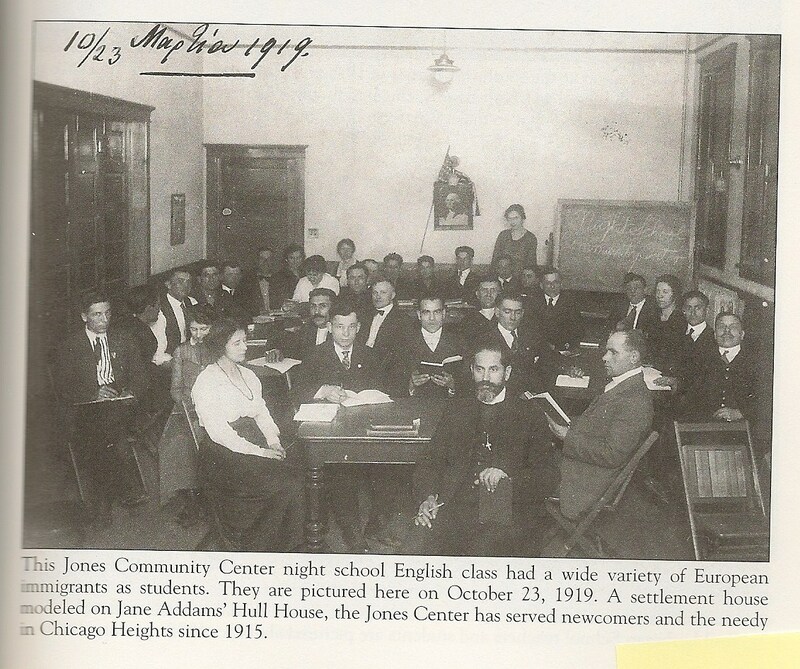 On May 1, 1910 Mr. De Luca organized night school classes in a hotel on Twenty-Second Street in the Hill neighborhood to teach citizenship and English. As the number of participants grew, it became obvious that rented rooms and church spaces were no longer adequate to house the classes. A fundraising campaign for $15, 000 was successful and a building to house these programs was completed in 1918 on East 15th Street. activities. Hot showers, the first on the East side of town, were available and were especially important to the men who did the hardest and dirtiest work in the factories but whose homes lacked hot water or indoor plumbing. In 1938 George Colbert Jones made a gift to the Center of 1500 shares of Inland Steel Company stock in memory of his son Harold Colbert. It was designated for the construction of an addition to the building that was to have a full size gymnasium, among other facilities. The original building was veneered to match the new. This is the Art Deco style structure that is visible today, exhibiting the common style characteristic of geometric ornamentation. It was designed by Benjamin F. Olson. Today, the Center’s mission is very much the same as it has been for 100 years. Neighborhood kids know this as their home, where they come before and after school. A safe haven. A great place with great people. Unfortunately, they are in dire need for a new roof over the gymnasium and are campaigning to raise the money needed. Please visit their website to donate and to find a more detailed history of this amazing Chicago Heights place. In my short tenure as the chair of the preservation committee, I have been asked a few times if I know anything about Al Capone and his ties here. Where did he live, visit? Did he build tunnels? If so, where? Honestly, I don’t know. There are sooo many more things I, personally, care more about in this city. But, history is history….so here is a bit on the existence of tunnels. A quick search of the internet brought up places where it is said Capone used tunnels for escape and bootlegging purposes. One as close as Thornton, others in Burlington WI, and Canada. A May 2005 Star article talks about how Chicago Heights not only served as a refuge for Capone, but was where many of his liquor stills were located. When first posed with the question of tunnels I asked past Chicago Heights historian, Barbara Paul‘s husband. Since her passing, he, and the books she and Dominic Candoloro wrote, are my link to all that she knew – and that was a lot. He told me that she never knew of any and didn’t believe they existed. Now, that is a tough pill for a lot of people to swallow, I am sure. But the nature of these things, secret tunnels, well, are secret. The stuff of “if I told you, I’d have to kill you”, right? There just may be places, maybe in YOUR basement. Maybe you, or your uncle, held your own Geraldo vault opening only to find canned tomatoes and empty Peroni bottles? But if there were tunnels, we’d know by now. Our streets – and homes- would have caved in by now. If there were tunnels here, they could not have traversed the city and still be unknown. 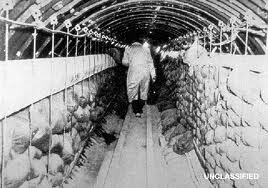 Tunnels running short distances are more likely, other places had them as well. From home to store, home to home, or from home to carriage house I could believe. A deep cellar for canning and sausage making more likely. I think I understand why Barbara, and now I, am reluctant to delve into this subject. So many reasons. Yet, it is an interesting question. Are there secret tunnels in Chicago Heights?